This works like the Facebook Ads you are used to. 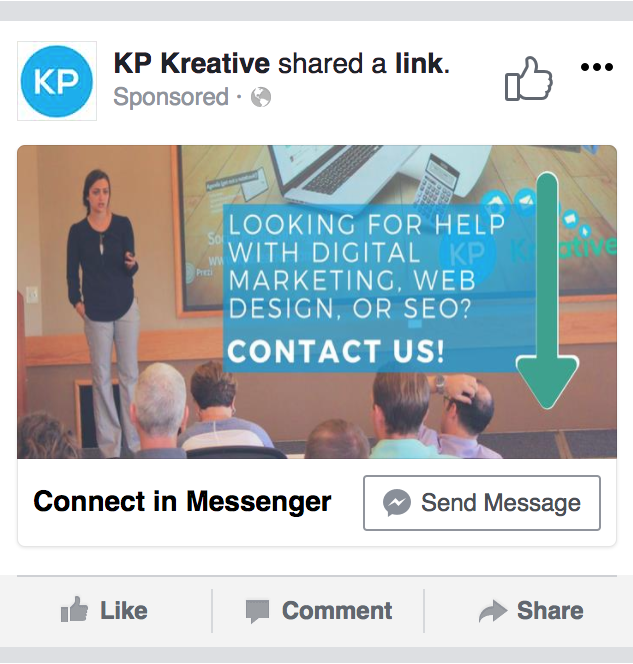 You make your display ad and it shows up in the Facebook News Feed, but instead of sending people to a landing page it sends them to a conversation on Facebook Messenger. It’s a great way to start a conversation with a lead and since it's still new people are more likely to convert this way. These ads focus on reaching people in the Facebook Messenger Ads Inbox. In this type of ad format your ad shows up in their inbox, but they would have to initiate a conversation with you by clicking your call to action button. This will not take them to a landing page, but to a conversation with you in the messenger app, so remember to create your ad content accordingly! Sponsored messages can only be used for retargeting. Meaning the people who see these messages (which go directly to their inbox like a normal Facebook message) would have had to initiate a conversation with you previously. With this ad format, you can be much more direct since these messages are only going to users who have already engaged with you. The only catch here is that these ads can only be shown to people who have already messaged your page. This may seem like a small selection, which is great. It's people who have already expressed an interest in your business in a major way, meaning they are much more likely to convert. If you're looking for more specific help with your Facebook marketing, we'd be happy to help. Contact us for more information.